Lauren Bonds the Development Manager at the ALS Association TN Chapter is presenting a plaque of appreciation to Bill Evans. 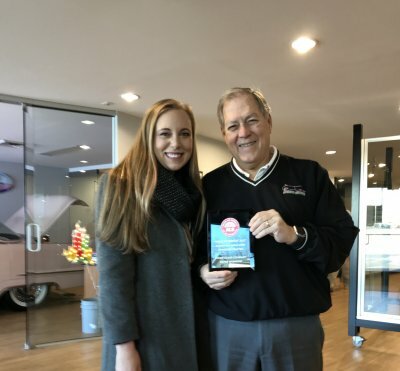 Evans Glass Company was presented this award for being a loyal supporter of our Nashville Walk to Defeat ALS which was on October 27, 2018 at Lipscomb University. 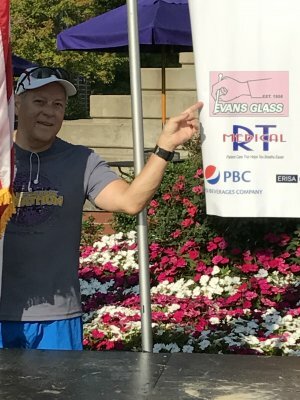 Evans Glass Company was a Silver Sponsor at the Walk to Defeat ALS and with this sponsorship ALS is able to continue to provide care services to ALS patients throughout the state of TN while also funding research to help us find a treatment and cure for ALS. 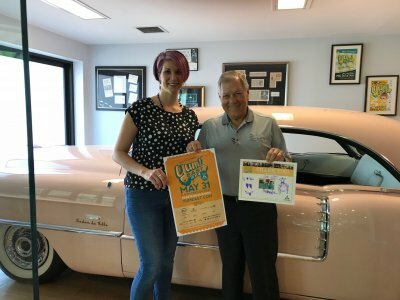 Melissa McWilliams, Development Director at Fannie Battle Day Home makes a presentation of thanks to Bill Evans of Evans Glass Company for their sponsorship of Yumeast on May 31 2018. 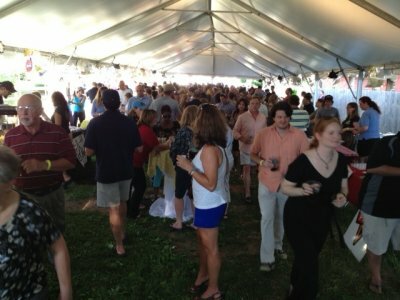 This was the 6th annual event which Evans Glass Company has been a sponsored each year. 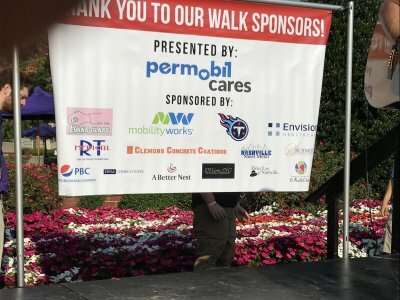 On September 23,2017 Evans Glass Company was a sponsor for the Walk to defeat ALS held at David Lipscomb University at a distance of 1 mile. More than just a few-mile trek, the Walk to Defeat ALS® is an opportunity to bring hope to people living with ALS, to raise money for a cure, and to come together for something you care about. The Walk to Defeat ALS® is The ALS Association's biggest annual event, which raises funds that allow our local chapters to sustain care services and support research for much of the next year. 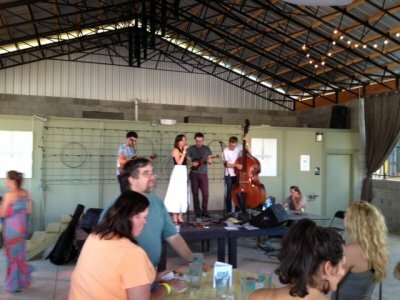 Evans Glass Company was again the glass sponsor for the fifth-annual Yum!East held June 1, 2017 at Pavilion East located at 1006 Fatherland St. 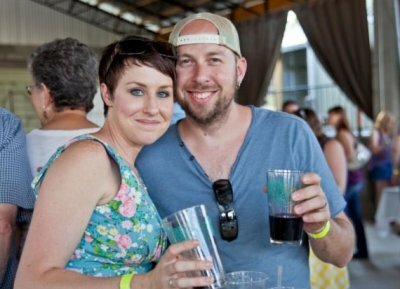 This event raises funds for the Fannie Battle Day Home for Children while showing off the best of East Nashville’s dinner and drink. 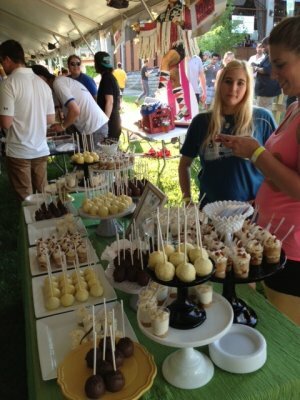 Food and drink samples will be served up from 30 different East Nashville restaurants. 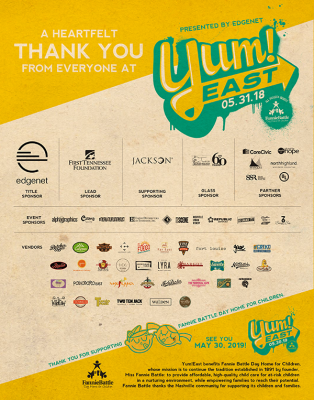 Also want to add a link or information about Yum East under Community as Evans is a sponsor. You think of Bill Evans as a runner, and he is. But, on Saturday, August 18, he was a volunteer at the Vaco Brentwood Kids’ Triathlon held at the YMCA in Maryland Farms in Brentwood. 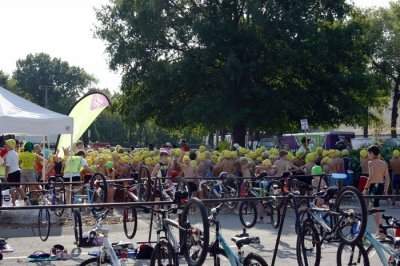 Over 400 kids, competing in three age groups, swam, biked and ran on this beautiful summer day. 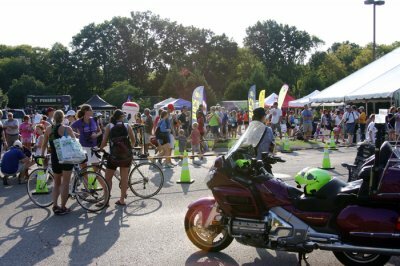 For real early birds, the girls “Tri-It-On” Triathlon took place at 7:00 a.m. Like many others, Bill and his wife Sue, volunteered their time and talents to help this event go smoothly. And, if you have ever volunteered or been involved in any type of event such as this, “smooth” is what everyone strives for! It was a great day to run and to volunteer. 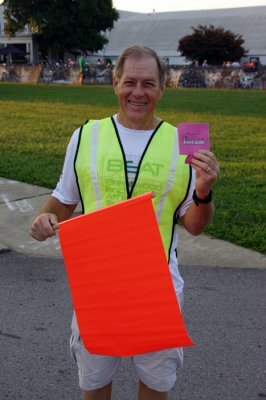 On September 11, 2010, Bill Evans achieved his goal of running 56 miles in one day to celebrate his 56 birthday, and also to bring awareness and support to The Salama Institute in Nashville. 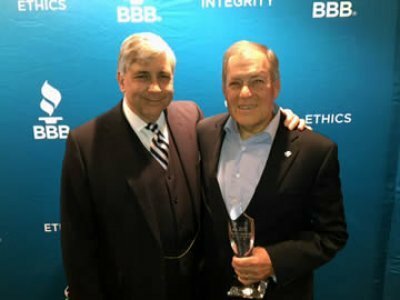 This extraordinary accomplishment reflects Evans Glass Company, where their commitment to clients means going the distance. For 25 years, Salama (Swahili word for peace) has provided life-changing programs that equip students with skills needed for success in life and to nurture lives of integrity and hope through the foundation of faith. 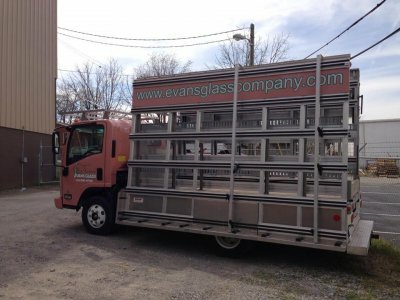 Evans Glass is proud to support the community of Nashville. 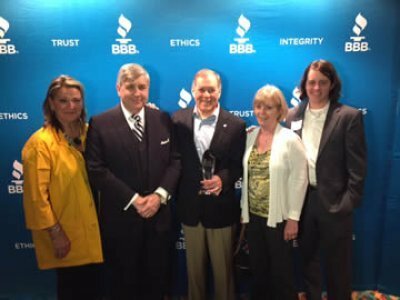 Better Business Bureau Middle Tennessee - An ethical marketplace where buyers and sellers trust each other. 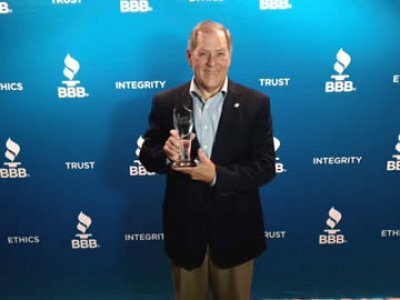 BBB’s mission is to be the leader in advancing marketplace trust. Salama Urban Ministries - For more than 25 years, Salama (Swahili word for peace) has served the Greater Nashville area by providing life-changing programs that equip children with skills needed for success in life. Salama provides a year-round, 5-day/week extended learning program that develops youth into value guided leaders. We serve grades K-12. We invest approximately 650 hours a year of instruction per student in academics, the performing arts and spiritual development in the Christian faith. Justice Industries - The Vision of Justice Industries is to become the world’s largest employer of chronically unemployed and under-employed adults, freeing thousands from lives of generational poverty and ushering them into lives that make significant contributions to their families, their communities, and to the greater purposes of God. 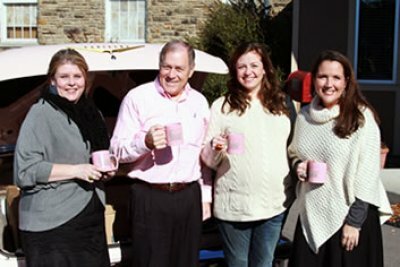 We had a board meeting yesterday evening, and shared one of the Evans Glass Company mugs with each of our board members, along with a special update on how involved Evans Glass Company has become with the Fannie Battle Day Home organization. Everyone at Fannie Battle Day Home extends their extreme thanks! 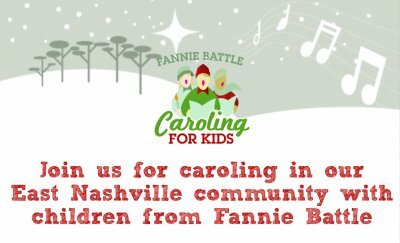 Thursday, December 5 at 5:30 p.m.
Meet in the auditorium at Fannie Battle Day Home for Children, 108 Chapel Avenue, 37206, where we’ll divide into groups and head out for an evening of caroling to raise funds for Fannie Battle Day Home. We’ll meet back at Fannie Battle at 6:15 p.m. for cookies and cocoa. Sue and I were accompanied to the Yum!East festival by Marc and Julie Severance. 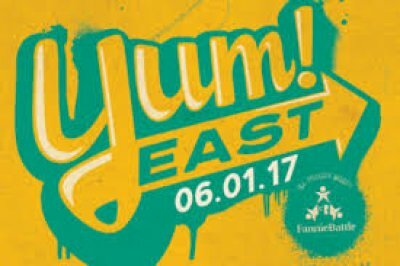 Yum!East was a benefit for the Fannie Battle Day Home for Children. 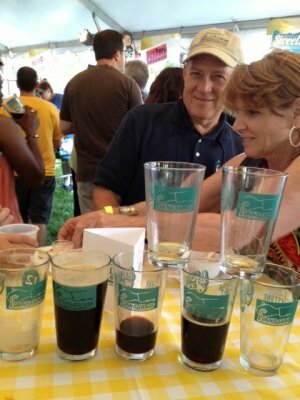 Evans Glass Company was the pint glass sponsor. The festival had 20+ food vendors and several craft brew vendors. 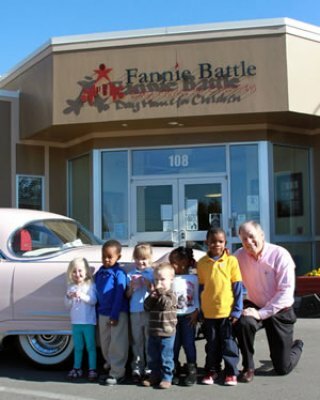 Fannie Battle sold 680 out of 700 potential tickets to the festival. I anticipate continuing Evans Glass’ relationship with Fannie Battle. Organization Steps Up to Help Wounded Veteran. Keith Hale was on the front line in defense of America while serving in Iraq, but when the veteran returned to Nashville, he needed someone to step up and fight for him. The U.S. Army sergeant was left severely wounded with brain and nerve damage after a June 2010 incident while on his second tour of duty in Mosul, Iraq. 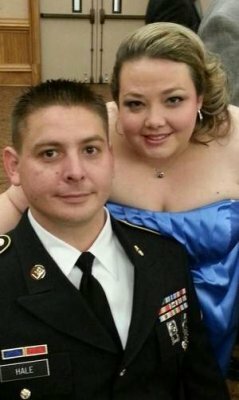 Upon his release from the Warrior Transition unit at Fort Campbell, he was considered 90 percent disabled and suffers from memory loss. Hale; his wife, TiAnna; and their three children were forced to move in with his mom, while waiting on a letter from Veterans Affairs qualifying him for a mortgage loan guarantee. However, her home lacked the wheelchair accessibility that Hale needed. And when the VA was unable to authorize funds to build the ramp in a timely manner, the Coalition to Salute America’s Heroes stepped up. 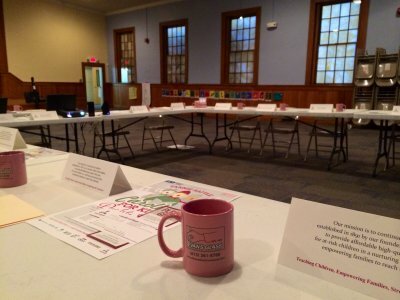 Organization officials heard of Hale’s plight through a board member who lives in Franklin. They rallied volunteers and local companies, including Evans Glass and Shaub Construction, to build a ramp at Hale’s mother’s house. The crew also constructed a smaller ramp inside, as well as another that allows Hale to access the back patio for one of his favorite pastimes — cooking on his grill. “This has really helped me a lot as I don’t need anyone to help me get in and out of the house,” said Hale, 33. TiAnna Hale says the ramp eased the accessibility concerns but also bought back her husband’s independence and confidence. The couple spent months waiting for construction to be complete on a custom house retrofitted for wheelchair accessibility. But delayed paperwork from Veterans Affairs, they say, prevented them from closing on their home loan. It could be up to 11 months before they receive the needed paperwork, TiAnna Hale said. Jan Dew, public affairs officer with the Veterans Affairs Regional Office in Nashville, said she didn’t have specifics about Hale’s case, but could research it further upon his request. “We try to provide a lot of different avenues for assistance, and there is a certain amount of time it takes to process a claim,” she said. “If there is something they are not sure about what kind of forms they need to file, we do provide different avenues to get the right information into us. 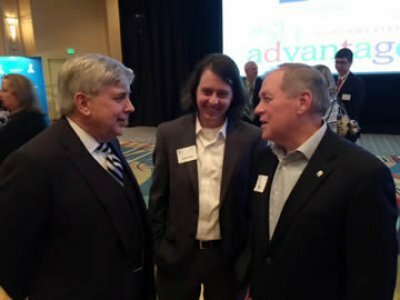 Coalition to Salute America’s Heroes, a Leesburg, Va.-based organization, is dedicated to rebuilding the lives of severely wounded veterans. The organization regularly provides gift checks to cover such things as meals, medical and utility bills. “It’s an unfortunate reality in today’s world that brave men like Keith Hale return home from the battlefields of Iraq and Afghanistan with severe injuries and our government simply isn’t there for them,” said David Walker, president and CEO of the Coalition to Salute America’s Heroes.